The international press diffuses a single narrative of Haiti - one of political instability, malnutrition, disease and devastation. "The poorest country in the Western hemisphere" - this is how Haiti is too often described, ignoring the many layers that comprise Haitian culture and customs and make Haiti one of the most fascinating yet least understood countries in the region. In late May, four staff from MCC’s North American advocacy offices and the Colombia-based regional policy analyst visited Haiti for one week to engage with MCC Haiti partners with the goal of strengthening MCC’s Haiti advocacy work among its New York, Ottawa, Washington, Colombia and Port-au-Prince offices. During this time they got to encounter Haiti as it is, not as the sensationalist press so often describes it. What follows are trip participants' reflections that defy the stereotypes and offer a different perspective on Haiti, not a place of desperation but a land that is verdant, passionate, vibrant, and courageous. Members of CODDEMIR and the Dominican human rights organization Centro Bono with the MCC team in Malpasse. Ted Oswald. Haiti and the Dominican Republic (D.R.) are facing a migration crisis. For much of their history, tensions have been high between the two nations, most recently due to D.R. policies that discriminate against Dominicans of Haitian descent and Haitian migrants. In 2013, a new law stripped tens of thousands of Dominicans of Haitian descent of their citizenship and, along with Haitian migrants, were made victim to sporadic and sometimes violent deportations to Haiti. These policies and actions in the D.R. can be understood as a further attempt by the D.R. government to blame the country’s social and economic ills on Haitian migrants or Dominicans of Haitian descent, essentially scapegoating an entire group of people. “When one person’s human rights are violated, everyone’s rights are violated” - Pierre Garot Nere, Coordinator of CODDEMIR, at CODDEMIR's offices in Malpasse, Haiti. Anna Vogt. During our journey in Haiti we spent time at the border, visiting those working on the front lines of this crisis. We met with members of a coalition of 15 Haitian groups, collectively known as CODDEMIR. For the past seven years, CODDEMIR (in English, the Collective of Organizations working for the Defence of Human Rights for Migrants and the Repatriated) has been pooling financial and human resources for one common goal of standing with the displaced from the D.R. CODDEMIR engages in national and international advocacy on their behalf, through press releases, reporting, emergency assistance and education. Their passion and dedication spoke volumes to me; I felt hopeful creating a sense of hope as they shared their desire to protect those who face difficult and divisive situations. 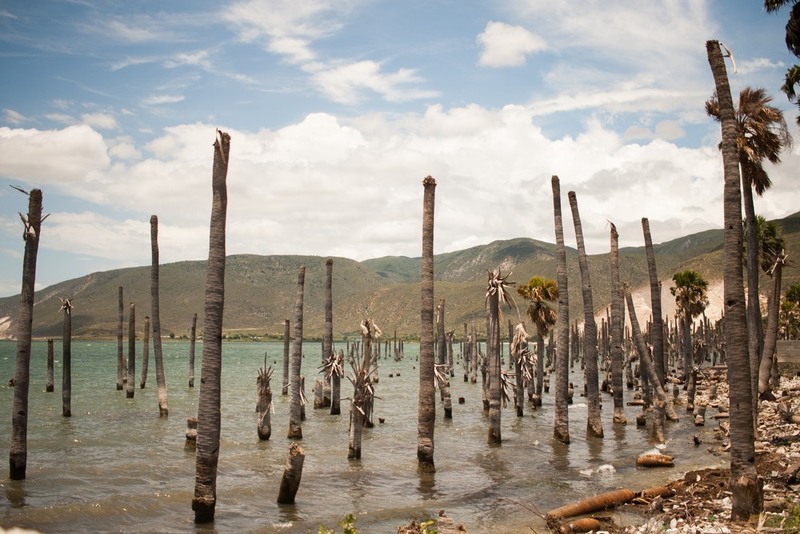 Stripped palms on Lake Peligre, in the border area of Malpasse. Anna Vogt. The influx of people crossing the border since June 2015 has caused resentment in some Haitian communities. CODDEMIR has come alongside these communities to educate them about returnees’ needs. As a result, when CODDEMIR’s welcoming center is overcrowded, more local families and communities take displaced people into their homes. Human rights groups, including CODDEMIR, are calling for significant action; action inside the D.R. to reverse laws discriminating against Haitians and those of Haitian descent, and action by the Haitian national government to come alongside migrants and also invest more in Haitian communities so people don’t feel they have to leave. They are also calling on the international community to pressure both governments to respond justly to the situation. At the core, these organizations are calling for the recognition of our common humanity, encouraging all of us to welcome others, support each other, and stand together. In this, we can say that Haiti is passionate about welcoming and caring for others. Read stories from youth caught at the border and learn how to pray for the migration crisis in Haiti and the D.R. Rebekah Sears is a policy analyst with MCC’s Ottawa Office.